A new pluripotent stem cell (PSC) medium is designed to offer researchers unprecedented schedule flexibility, allowing two-day breaks from culture feeding without having to make changes to current workflows or compromise culture quality. Researchers can save time and reduce sample handling, thereby decreasing the risk of contamination. The Gibco Essential 8 Flex Medium, from Thermo Fisher Scientific, will debut at the International Society for Stem Cell Research (ISSCR) 2015 Annual Meeting, June 24-27, 2015 at the Stockholmsmässan Exhibition & Convention Center, Stockholm, Sweden Booth B06:32 and B06:33. Culturing PSCs is a technical and time-consuming process. Many stem cell media components, such as fibroblast growth factor 2 (FGF2), lose activity at physiologically relevant temperatures and, therefore, stem cell cultures must be fed daily to preserve pluripotency and tri-lineage differentiation potential. To achieve this, scientists typically must work through the weekend or delegate feeding steps to other scientists, which can introduce unnecessary variability. With this optimized formulation, Essential 8 Flex Medium grows and maintains PSCs over an extended length of time. Unlike other commercially available PSC culture solutions that promise, “weekend-free feeding,” the new Gibco medium does not require substantial split-ratio adjustments prior to the break in feeding. Moreover, Essential 8 Flex Medium retains nearly 90 percent FGF2 activity after 72 hours, while competitor brands fall to close to 10 percent FGF2 activity within 24 hours. 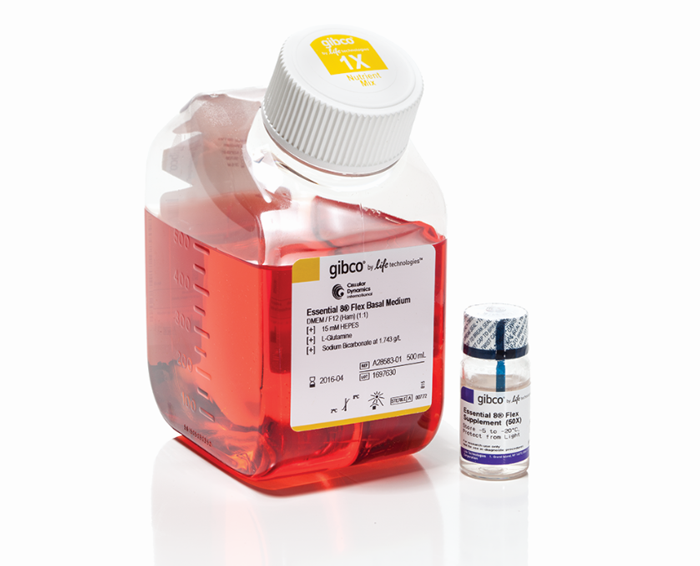 The Gibco Essential 8 Flex Media is for research use only and is part of the Gibco Essential 8 Medium family of products launched in partnership with Cellular Dynamics International, a FUJIFILM company.